As the preference for nonsmoking rental properties grows alongside increased government regulations, landlords who wish to initiate a smoking ban have to develop a plan of action. One step in that process is to develop a lease agreement that effectively covers the smoking policy and protects the landlord. The Initiative for Smoke-Free Apartments partnered with Minnesota attorney Douglas J. Carney, of Hanbery, Neumeyer & Carney, P.A., to prepared this Model Lease Addendum. Mr. Carney received ongoing advice, consultation, and recommendations from a legal advisory committee that included attorneys who regularly advise property owners and managers, who serve as tenant attorneys and advocates, or who advise public housing agencies. Representatives from the Center for Energy and Environment and Association for Nonsmokers-Minnesota were also on the committee. Landlords may use this Model Lease as a guide for developing a nonsmoking policy, but are advised to have a local attorney review any lease changes. 2. Definition of Smoking. The term smoking means inhaling, exhaling, breathing, or carrying any lighted cigar, cigarette, or other tobacco product or similar lighted product in any manner or in any form. 4. Tenant to Promote No-Smoking Policy and to Alert Landlord of Violations. Tenant shall inform Tenant’s guests of the no-smoking policy. Further, Tenant shall promptly give Landlord a written statement of any incident where tobacco smoke is migrating into the Tenant’s unit from sources outside of the Tenant’s apartment unit. 5. Landlord to Promote No-Smoking Policy. Landlord shall post no-smoking signs at entrances and exits,common areas, hallways, and in conspicuous places adjoining the grounds of the apartment complex. 6. Landlord Not a Guarantor of Smoke-Free Environment. Tenant acknowledges that Landlord’s adoption of a smoke-free living environment, and the efforts to designate the rental complex as smoke-free, do not make the Landlord or any of its managing agents the guarantor of Tenant’s health or of the smoke-free condition of the Tenant’s unit and the common areas. However, Landlord shall take reasonable steps to enforce the smoke-free terms of its leases and to make the complex smoke-free. Landlord is not required to take steps in response to smoking unless Landlord knows of said smoking or has been given written notice of said smoking. 7. Other Tenants are Third-Party Beneficiaries of Tenant’s Agreement. Tenant agrees that the other Tenants at the complex are the third-party beneficiaries of Tenant’s smoke-free addendum agreements with Landlord. (In layman’s terms, this means that Tenant’s commitments in this Addendum are made to the other Tenants as well as to Landlord.) A Tenant may sue another Tenant for an injunction to prohibit smoking or for damages, but does not have the right to evict another Tenant. Any suit between Tenants herein shall not create a presumption that the Landlord breached this Addendum. 8. Effect of Breach and Right to Terminate Lease. A breach of this Lease Addendum shall give each party all the rights contained herein, as well as the rights in the Lease. A material breach of this Addendum shall be a material breach of the lease and grounds for immediate termination of the Lease by the Landlord. 9. Disclaimer by Landlord. Tenant acknowledges that Landlord’s adoption of a smoke-free living environment, and the efforts to designate the rental complex as smoke-free, does not in any way change the standard of care that the Landlord or managing agent would have to a Tenant household to render buildings and premises designated as smoke-free any safer, more habitable, or improved in terms of air quality standards than any other rental premises. Landlord specifically disclaims any implied or express warranties that the building, common areas, or Tenant’s premises will have any higher or improved air quality standards than any other rental property. Landlord cannot and does not warranty or promise that the rental premises or common areas will be free from secondhand smoke. Tenant acknowledges that Landlord’s ability to police, monitor, or enforce the agreements of this Addendum is dependent in significant part on voluntary compliance by Tenant and Tenant„¢s guests. Tenants with respiratory ailments, allergies, or any other physical or mental condition relating to smoke are put on notice that Landlord does not assume any higher duty of care to enforce this Addendum than any other landlord obligation under the Lease. 10. Effect on Current Tenants. Tenant acknowledges that current tenants residing in the complex under a prior lease will not be immediately subject to the No-smoking Policy. As current tenants move out, or enter into new leases, the smoke-free policy will become effective for their unit or new lease. 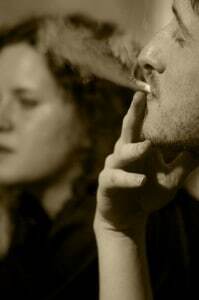 See More Pressure on Landlords Over Smoking Policies.